I love it and carry it with me everywhere. My concern is: Would it be officially allowed in cabin (inside Schengen)? If not, what are the possible consequences of carrying it with me? The rules about knives through airport security vary from country to country. Generally, they all include "a blade over x cm in length". While x may vary, your blade looks to be at most 4 cm or 1.5". So if the rule is a blade over 5cm/2" is not allowed, you'll be fine. I think that is the rule most places, and there was talk of raising it to 7cm in the US last year, though I didn't notice whether it went through or not. I don't know of anywhere that has a 1" or 3cm rule. One example: in Zurich the rule is 6 cm. 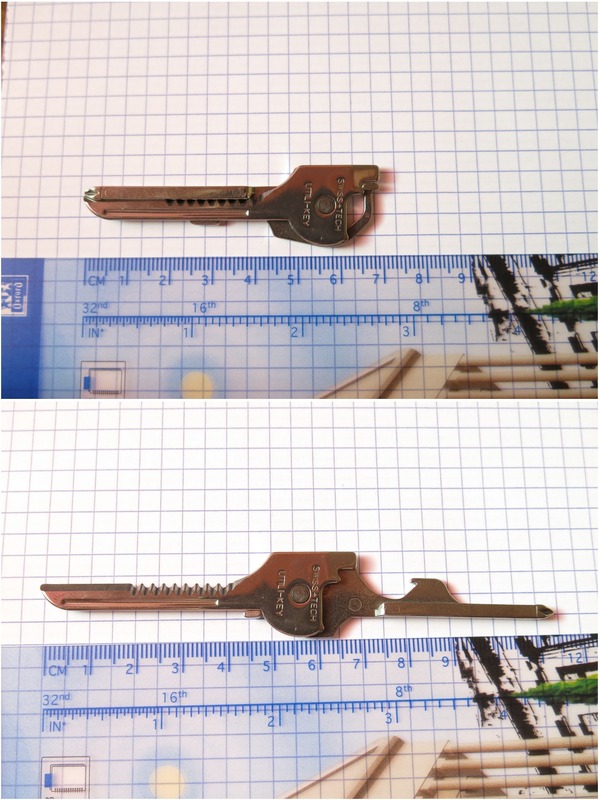 There is also the matter that keys are unlikely to be inspected for blades. I wouldn't rely on this if your blade was illegal, but if it doesn't occur to them to look at your keychain, you won't have the delay of waiting while someone opens the knife, measures the blade, gets a supervisor to rule about the length etc. If you try to take something through security that isn't allowed, the worst thing that happens is they confiscate it. Sometimes they have envelopes to let you mail it to yourself or donate it to a local charity. You won't run any risk beyond losing the item. If it's important to you (people have cried telling me about confiscated items that were a gift from a parent when they were young, for example) don't take it with you. Even though you feel it meets the rules you may run into someone who disagrees - and the traveller doesn't win those arguments. I carry one of these on my keychain, with 6 or 7 other keys. I've flown US domestic flights with it about half a dozen times and never had a problem. I gave one to all my coworkers for Christmas a few years back. One of these coworkers is a Muslim woman who wears a hijab. She flies a lot, and ALWAYS gets selected for "random" extended screening. At least once, she accidentally left the Keytool on her keychain and got through security with it. Anecdotal, surely, but I think telling. The thing is just not very noticeable. is taken from EU185-2010, which contains another 50 or so pages of rules, such as you have to legitimate yourself with a boarding card and passport, or how your hand luggage must be searched, and what amounts of liquids and aerosols you may take with you (there's also EU 300-2008, but that one is pretty irrelevant from the PoV of a traveller). Regarding your tool key, it mentions "sharp or pointed items such as [...] razor blades, cutters, [...] knives or sciccors over 6cm, martial arts instruments with a point or edge". Of course razor blades are more like 3cm, not 6cm, so it's a bit moot. It also mentions "tools which might cause severe injuries or be a hazard to aviation", giving drills, saws, and blades as example (among others). Does not seem to contain anything about weapons or weapon-like items other than tasers and ammunition. Funnily, it disallows tasers and other "incapacitating items" (quite obviously) but explicitly allows carrying a defibrillator. It also forbids lithium batteries over 100Wh, but that's usually not a problem since your laptop will have only about half as much. Your tool might easily be seen as 6cm knife, or "sharp" or "pointed" item in general, or as a kind of kubotan (= pointed martial arts instrument). It might also qualify as "saw" or "tool blade". Insofar I wouldn't risk taking it with you, security personnel isn't well-paid, and they might want a tool key for free. You probably do not need to fear prosecution, though. EU 185/2010 very clearly states that if something is detected, you are either denied passage to the "fly side", or the item will be confiscated and you must undergo a new examination until the examiner is satisfied. I'm not a lawyer, but from this very explicit wording (and the absence of mentioning penalties) I'd guess it is quite clear. In the US, certain "tools" are not allowed on planes any more than "knives". I had left a small Torx wrench in my pocket once - like an Allen key but with a star shaped head, about 8 cm long. It was confiscated as a "tool" (I guess they thought I would unscrew the cockpit door with it). But that was about 10 years ago. In general, you are prohibited from traveling with sharp objects in your carry-on baggage; please pack these items in your checked baggage. Scissors with blades smaller than 4 inches, small needles carried for special medical needs, and other sharp objects that do not contain a blade may be placed in carry-on baggage. Any sharp objects placed in carry-on or checked baggage should be properly sheathed or securely wrapped to prevent injury to TSOs and baggage handlers. In March 2015, I accidentally left it on my keychain while going through security in a U.S. Airport. The TSA agent noticed my keychain in the bin and asked about the Swiss tech key chain tool. After he examined it he declared it a blade and tossed it in the bin, never to been seen by me again. My advice, leave it home. Not the answer you're looking for? Browse other questions tagged air-travel schengen airport-security gear hand-luggage or ask your own question.